PETALING JAYA: After a dismal showing in the Super League, Petaling Jaya Municipal Council (MPPJ) are going great guns in the on-going Malaysia Cup competition. The Black Widows have six points from two straight wins over Malacca (4-1) and Brunei (3-1) in Group D. They play against Perak next at the MPPJ Stadium in Kelana Jaya on Saturday and are on track to qualify for the quarter-finals. Newly appointed coach Khan Hung Meng said the team have something to prove after having gone on a roller-coaster ride in the first half of the season. HOT: Juan Manuel Arostegui has recovered from injury and is scoring again for MPPJ in the Malaysia Cup. The club side, boosted by a whopping RM15 million budget, was rated highly after buying several good players to beef up the team but finished fifth in the Super League and were knocked out of the FA Cup competition in the second round by Premier League side Terengganu (1-5 on aggregate). “I guess our luck is also changing now after having gone through the worst. I hope the players can maintain their good form and go all the way from here to achieve something for the club,” said Hung Meng, their third coach this season. Ambitious MPPJ had pumped in millions and had expected a top-three finish in the Super League but their plans were derailed by a conflict in the team's management which saw their German coach Michael Feichtenbeiner dropped barely a month into the season. His replacement Brazilian Toni Netto failed to bring the desired results and now it is up to local Hung Meng to revive MPPJ’s fortune. “The game against Perak would more or less decide our quarterfinal berth. There is quality in this team and the players are bent on making amends for the earlier setbacks,” said Hung Meng, the former coach of Premier League side MK Land. The good news is that the ace striker Juan Manuel Arostegui is also back in form after fully recovering from injury and has managed two goals in two matches in the Malaysia Cup competition. 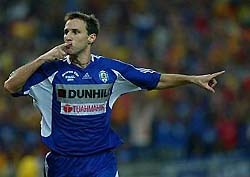 The Argentine, who scored 50 goals for the club en route to the Malaysia Cup title in 2003, managed only nine goals in the Super League since he made a return to the club this season. MPPJ have a formidable set of players like internationals Yusri Che Lah, Kaironnisam Sahabuddin, Tengku Hazman Raja Hasbullah, K. Nanthakumar, Chan Wing Hoong, Liew Kit Kong, Lim Chan Yew, Amir Shahreen Mubin and Azmin Azram Abdul Aziz.